Here is a guide on how you can enable remote desktop on Windows 10 to allow your computer to be accessed remotely using Settings app. You can easily enable this feature on your device as we are going to show you in step-by-step guide below. You can use this remote desktop feature to access and control a Windows 10 desktop PC, laptop or tablet from iOS, Android, Mac and Windows devices. 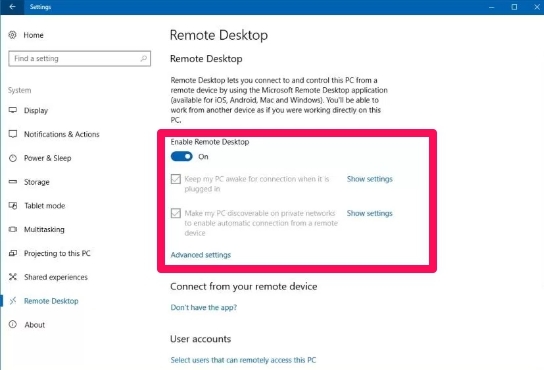 The way this Windows 10 Remote Desktop feature works is by using the Remote Desktop Protocol (RDP) that establishes remote (wireless) connection so that you can gain easy access to your Windows 10 device. This feature is included in Windows 10 to make it easier for you to access files and applications without having to physical be present near the device itself. In fact, the remote desktop feature has been a part of Windows experience for quite some time, which can be accessed from the Control Panel. But, in the Windows 10 Creators Update, it has been made possible to access this feature from the Settings app as well. In this guide, we are going to walk you through the steps to enable and configure Remote Desktop to access your files and apps when you are not physically present near your computer from the Windows 10 Settings app as well as Control Panel. Note: Remote Desktop feature is not available on Windows 10 Home edition, it can be used only on the Pro and Enterprise versions. 2 – Click on System. 3 – Click on Remote desktop. 4 – Under Enable Remote Desktop turn the toggle to ON position. 5 – Click the Conform button when finished. After turning on the feature, you can now go ahead and use the Remote Desktop app (you can download it from Windows Store) or use the built-in Remote Desktop Connection app in Windows 10. 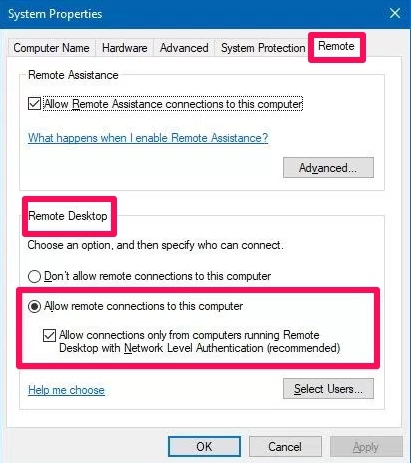 Now when you enable the Remote Desktop, two more options will be highlighted (Keep my PC awake for connection when it is plugged in and Make my PC discoverable on private networks to enable automatic connection from a remote device) to allow you to establish remote connection from anywhere. 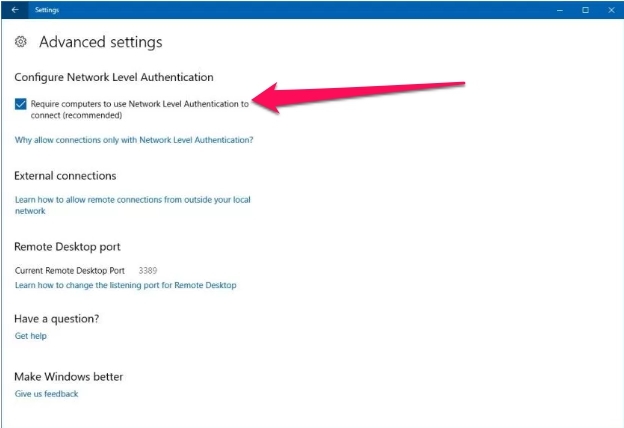 To help you beef up the security of the remote connection, another option has been added in the Advanced settings page, such as the ability to Require computers to use Network Level Authentication to connect. This is used to enhance the security around the connection and to prevent unauthorized person from getting remote access to your device. In the settings page, you will also find the current Remote Desktop port in case you want to configure a router to allow remote connections outside of the network. Do note that if all else remains the same, the port number should always be 3389. 1 – Go to Control Panel. 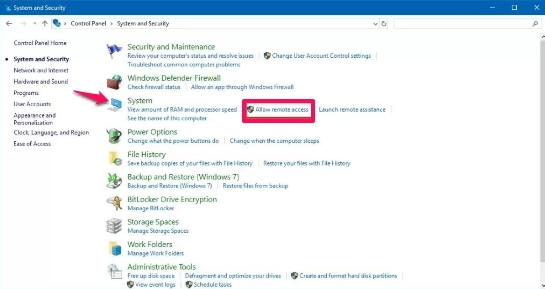 2 – Click on System and Security. 3 – Under ‘System’, click the Allow remote access link. 4 – Now, on the next System Properties box, under Remote Desktop, select the Allow remote connections to this computer option. 5 – Hit Apply and OK button when done. Once complete, you can now use the Remote Desktop app or the Remote Desktop connection client from another PC or device to connect remotely. Moreover, it should be noted that when you enable the Remote Desktop feature from the Control Panel, the Network Level Authentication also gets selected automatically, which you should always use to ensure the integrity to the connection. Another thing to remember that you can access the Remote Desktop from the Settings app starting from the Windows 10 Creators Update. If you are still using earlier version of Windows 10 or Windows 7/8.1, you can access and configure Remote Desktop from the Control Panel as shown above.